WHAT IS SOUNDBYTES? This is where we give a famous quote to one of our Ensemble members from a Shakespeare play (or other Elizabethan or Jacobean playwright) that they ideally haven’t performed, but at the very least from a character they haven’t played, and get their stream of consciousness response to the words and meaning in the form of a short article. As an added bonus to you, our visitors on the site, each quote comes with a free downloadable desktop wallpaper featuring an image relating to the quote and the quote itself. We start our Soundbytes feature with one of the famous lines from A Midsummer Night’s Dream: “The course of true love never did run smooth.” Shakespeare Republic Founder and Director, Sally McLean shares her thoughts about this oft-quoted line. This quote has become so well known that it is practically a proverb. People will often quote (and misquote) it when hearing of a problem between two people in a relationship, to comfort after a breakup or to simply make the observation that indeed, relationships are not always a bed of roses. FUN FACT: “Bed of roses” is not a Shakespeare phrase as many think, but rather from his early contemporary, Christopher Marlowe. It comes from Marlowe’s poem “The Passionate Shepherd To His Love”, which was published in 1599 after his death and the line is actually “And I will make thee beds of roses”. The poem begins with “Come with me and be my love”, which has itself been re-quoted in songs and other works of literature down through the ages. He is speaking to Hermia, his own true love, and she interjects in complete agreement with him, but for the purposes of this article, I’ve just given his lines in the play. Essentially, he is indeed in agreement with the modern take on what this line means – as evidenced by history, the course of true love never did run smooth, that much we can see for ourselves. But he is also specifically speaking about how it doesn’t run smooth due to outside influences or circumstances beyond our control. When he speaks of “different in blood” – he is speaking about coming from different classes in society, as well as upbringing. “Respect of years” means there is too much of an age difference between the lovers (Hermia responds there with “O spite! too old to be engag’d to young.” – which essentially underlines that he’s talking about too big an age gap being another potential issue) and “upon the choice of friends” refers to family, relatives, guardians and, yes, influential friends, who feel that someone else would be a better match for either of the lovers involved – or, as happened often in England when Shakespeare was alive, have already arranged a marriage for one of them (usually for the girl). In his next chunk of dialogue, Lysander goes on to say that even if the lovers could choose to be together, then something awful is bound to come along, like war, sickness or even death! (Cheery guy, this Lysander, not sure what Hermia sees in him at this point, but then again, thankfully I’m not a 16th Century damsel). He goes on to expound how fragile true love is, and finishes up with the happy thought that even if you got the chance to say “Cor! Look at that! I’m in love! Truly!”, the dark forces of the world (time, nature, other human beings) would “devour it up” – just like they do all good, happy things. (Wow, this guy is definitely winning in the “angst-ridden teenager” stakes, here!). Lysander and Hermia are having this conversation at pretty much the top of the play, due to her father announcing that she will not be marrying Lysander, but rather Demetrius, a lord of the court, whom she does not fancy one little bit (it could have something to do with the fact that Demetrius is also engaged to her best friend. Just a small problem, no biggie – much). Naturally, as it’s Shakespeare, she and Lysander both run away to the forest (which I feel always signifies an upturning of the social order in Shakespeare’s works, but that’s a subject for another article at another time), and things are then primed to go rather awry due to their running into a bunch of faerie folk (who are having their own troubles in the love department and have the worrying added bonus of magical powers and not much of a conscience), a troupe of amateur actors, called, potentially correctly, the rude Mechanicals, as well as having to play hide and seek to avoid Demetrius himself and Helena, Hermia’s aforementioned best friend. So, as Shakespeare is wont to do – they create their own course that is far from smooth – which means that “The course of true love never did run smooth” is, in fact, a self-fulfilling prophesy. Moral of the story? If you are banned from being with the one you love, don’t try to elope via a forest full of faeries and ambitious actors. Sage advice for all of us, really. If you’d like to download this wallpaper for your desktop, just right click over it and choose “Save As …” to save it to your hard drive. Enjoy! Hi my name is Jacqueline and I just wanted to drop you a quick note to say how great I think this project is and I’m loving these additional posts about Shakespeare’s language. I’m studying English Literature at school and I think this site will be really useful and interesting. I look forward to seeing the web series when it is released. All the best with everything and keep these articles coming! Thank you again. Hi, I just wanted to say that I agree with Jacqueline and her comments on how great this is – really enjoying the website and look forward to seeing the series! Do you have an actual date for when the first episode will be available to watch? And who will be in the first episode? Thanks! Thank you for this really interesting piece! I’m writing an assignment on Shakespeare at the moment and just wanted to say it was really helpful. I’ll cite this article in my bibliography as well. Look forward to the next one and the series when it is released. Hi, my name is Bianca and I just want to tell you how much I’m enjoying this site and your posts on Shakespeare … Here’s to your success with the web series! FINALLY someone talking about Shakespeare that I can understand! Thank you! 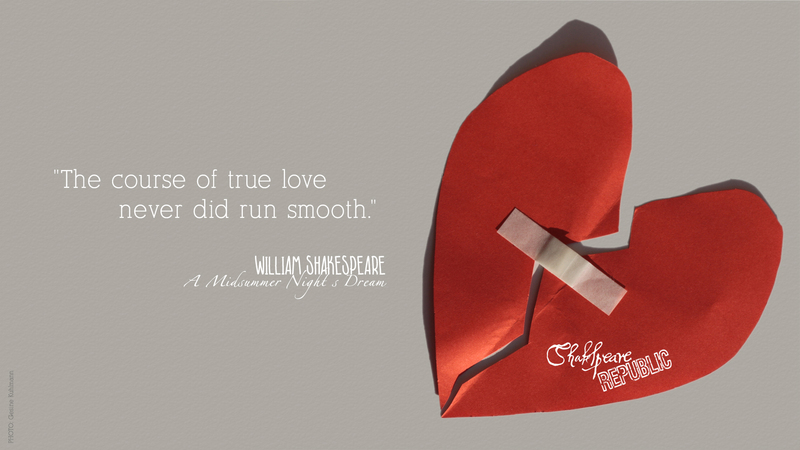 Posted On 23/04/2015 in Soundbytes with 6 Comments.Tagged: a midsummer night's dream, desktop wallpaper, heart, quote, wallpaper.